Devan Harris (35 points) made shots in close all night long. 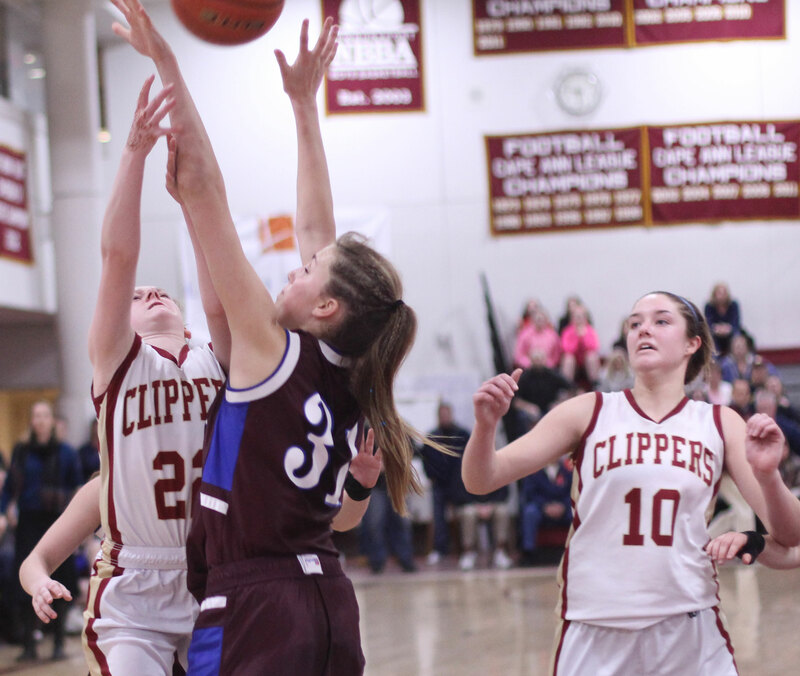 (Beverly MA) Danvers made only one shot from the outside, missed ten free throws, and didn’t take good care of the ball (eighteen turnovers) but they still found a way to win. How? The Falcons (20-3) totally dominated on the inside. 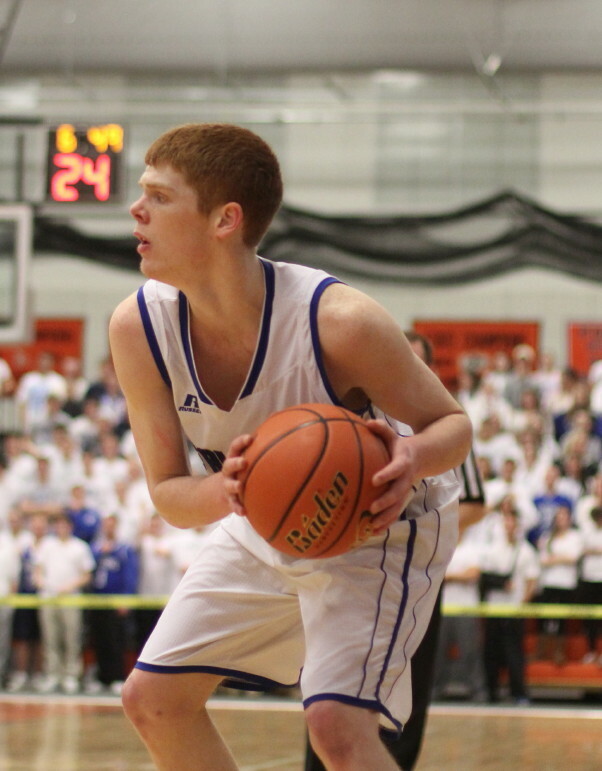 Control of the interior enabled Danvers to edge Belmont, 62-59, on Tuesday night to reach the Division 2 North finals on Saturday at the Tsongas Arena (3:45PM). Junior Devan Harris (35 points) was unstoppable inside gathering rebounds and converting seven caroms into put-back baskets. 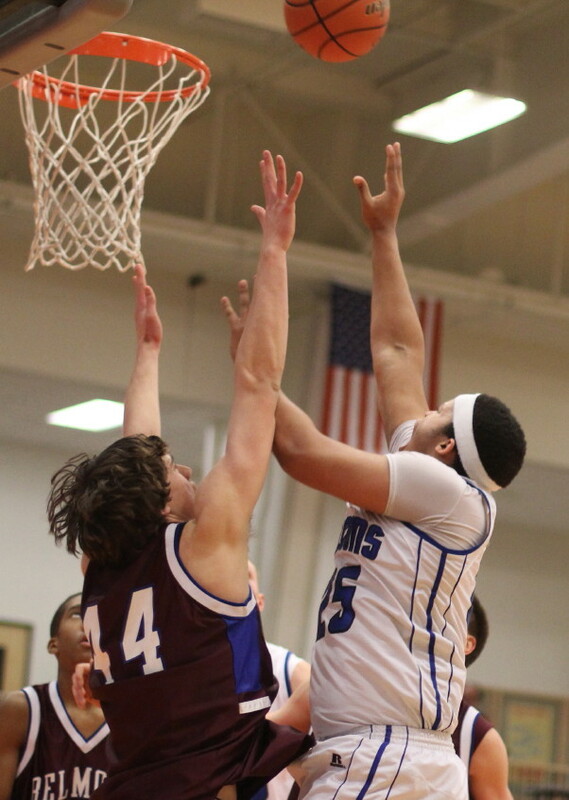 Peter Merry (6-8) had six blocks (by my count) and discouraged the Marauders a number of times from even taking shots close to the basket. This was a game in which leads were short-lived. 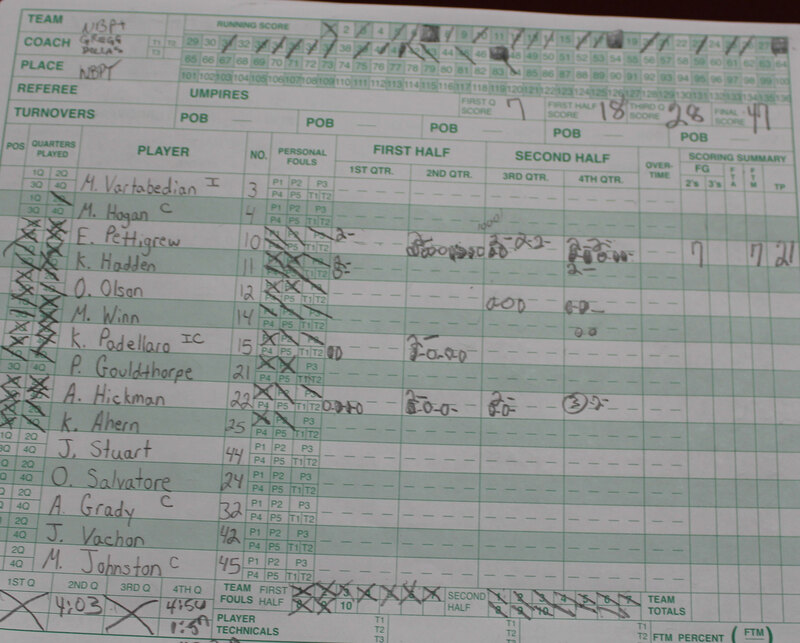 There were eighteen lead changes and the final one came with twenty-three seconds left. #6 Belmont (18-7) jumped ahead, 59-58, on a three by senior Keith Burns assisted by Matt Kerans with fifty seconds left in the game. After a Belmont timeout, Devan Harris tried an outside shot and missed but Kieran Beck came up with the offensive rebound and was fouled. 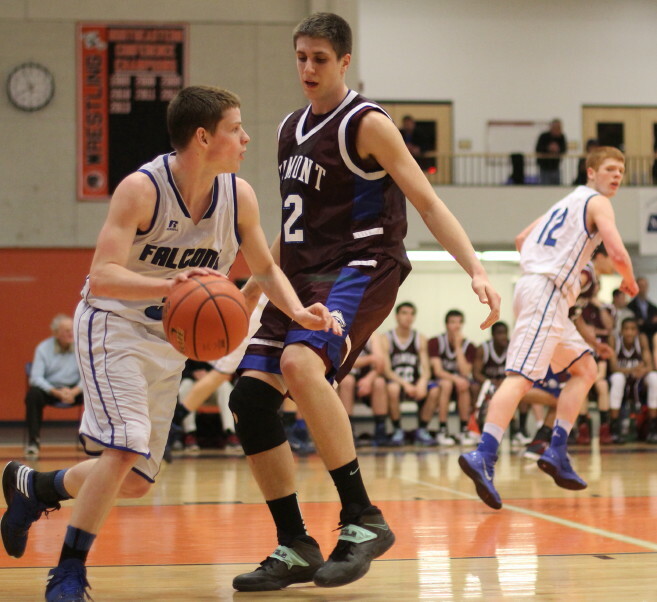 Kieran connected on both pressure shots giving the Falcons the lead, 60-59, with twenty-three seconds remaining. Matt Kerans tried a 3-pointer from straight away which rimmed out. 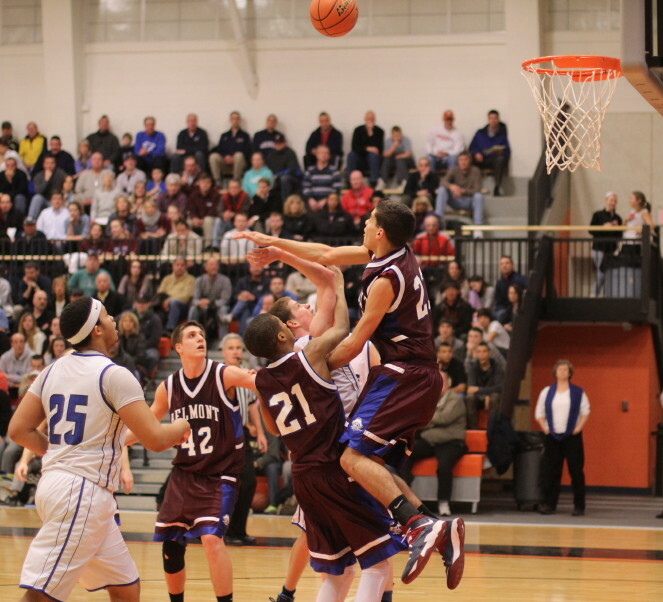 Devan Harris rebounded and was fouled. 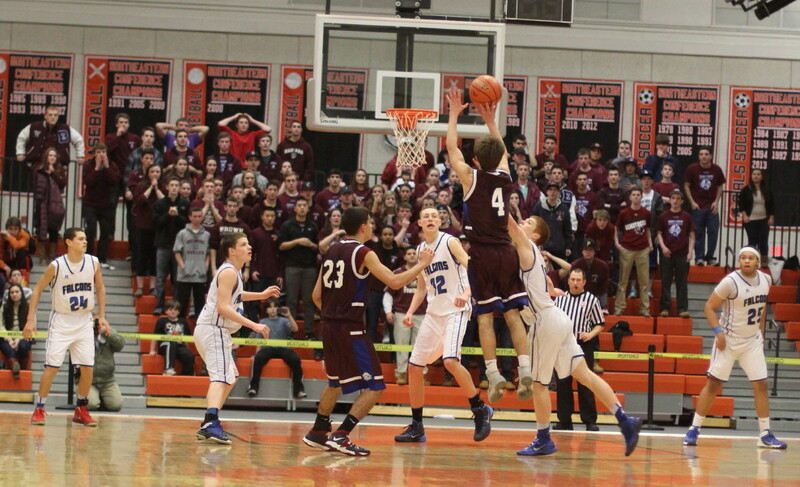 Devan made one of two giving Danvers a 61-59, edge with twelve seconds left. Matt Kerans went for another three, with Kieran Beck defending, and missed again with 1.4 seconds to go. 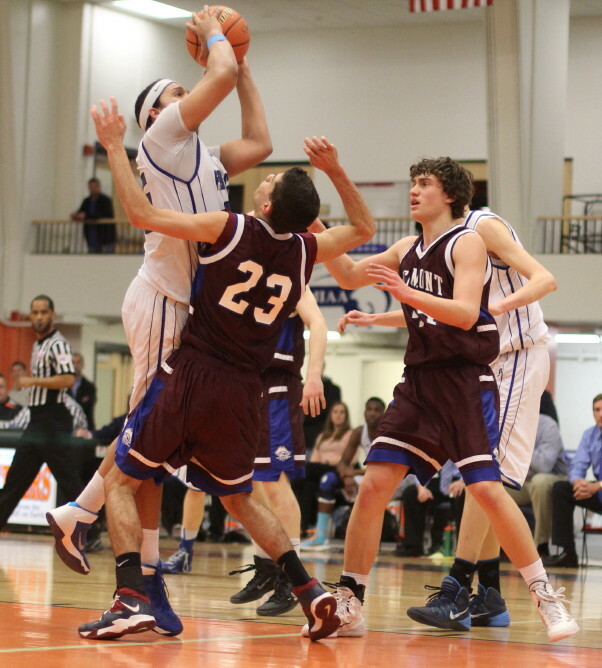 Freshman Devon Allen got this rebound, was fouled, and made one of two attempts. 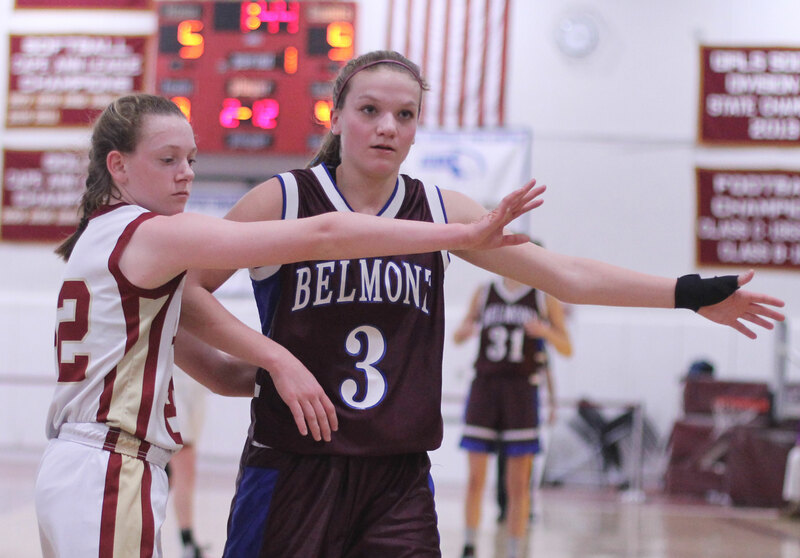 Belmont ended up with less than a second to try for a three. Kieran Beck intercepted the pass in and the celebrating began. Belmont was clearly at a size disadvantage from the get-go. 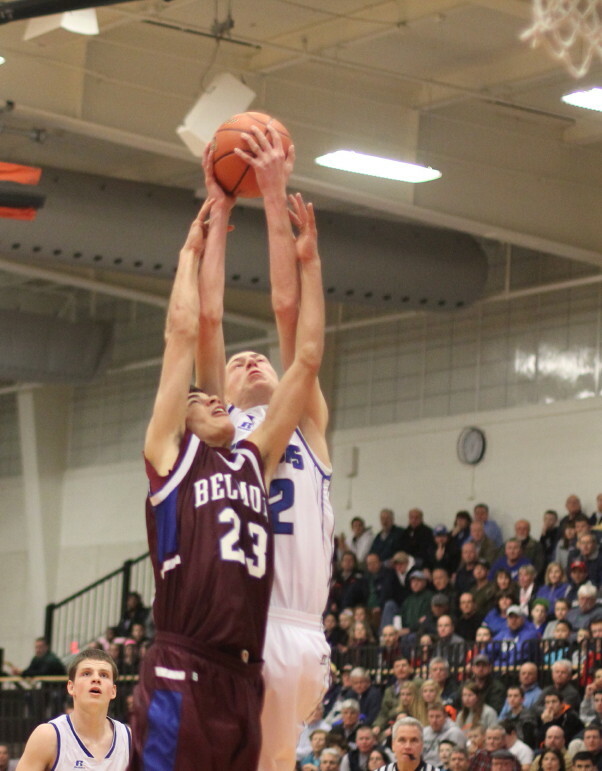 Adam Kleckner (6-4) was their tallest player and he fouled out at the end of the third quarter. 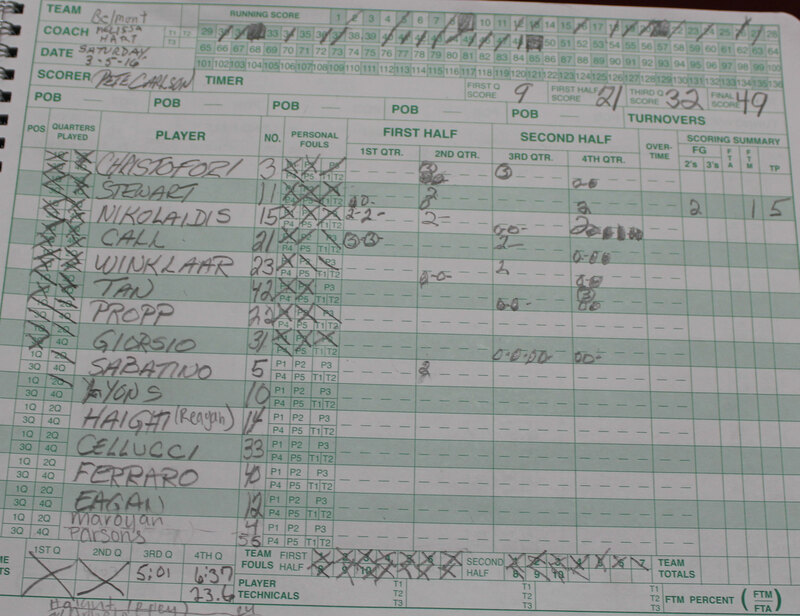 Adam had a quiet six points in this game. 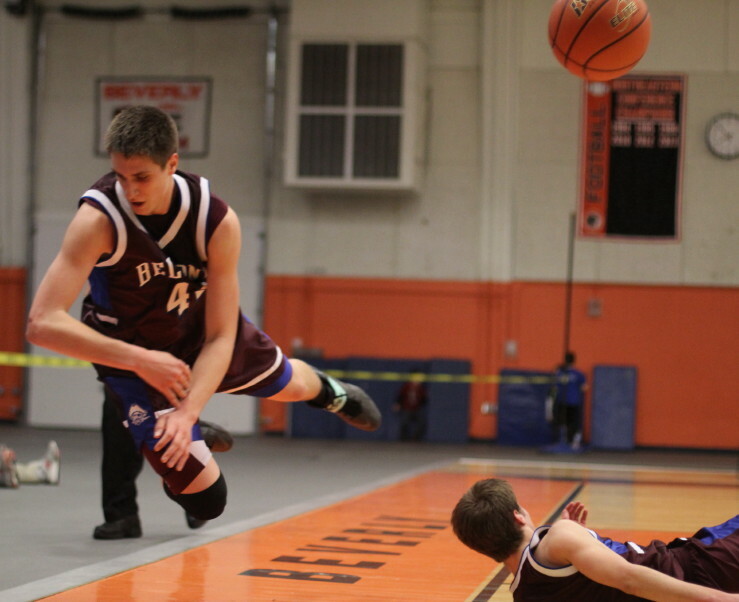 In the Belmont win over Salem in the D2 North quarterfinals, Adam had twenty-one points. 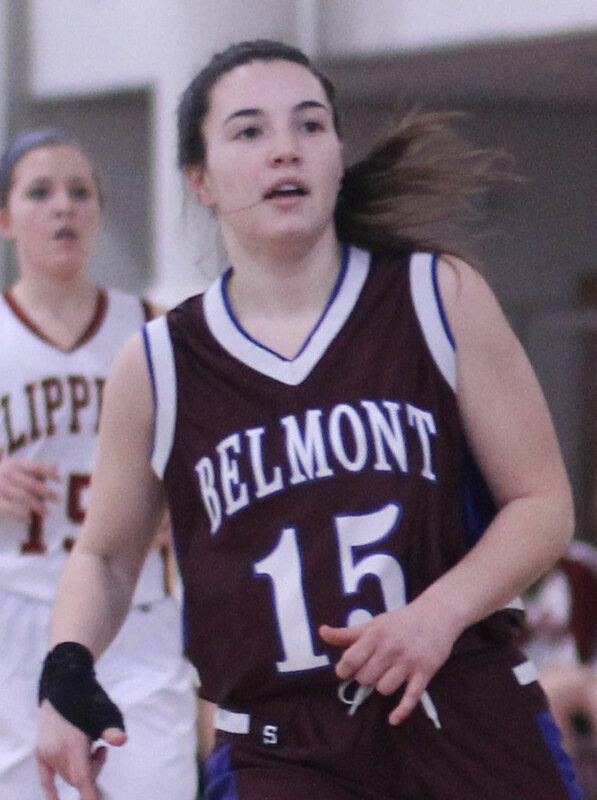 Earlier in the season, in a win over Lexington, the Belmont junior put up thirty-six points and collected fifteen rebounds. 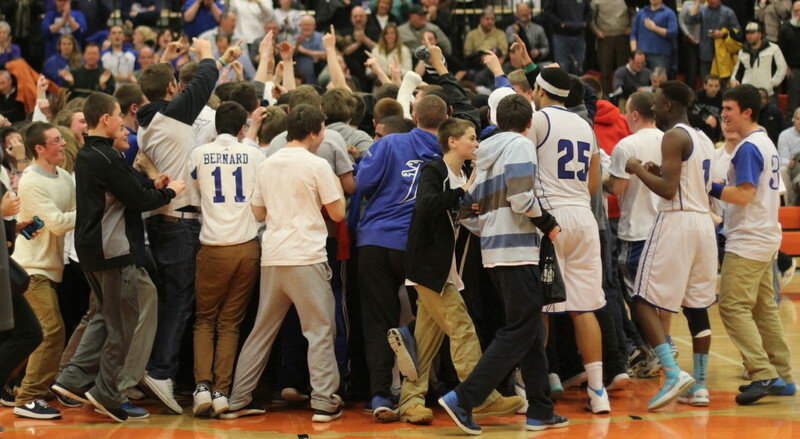 No question the Marauders missed Adam at both ends of the court in the final quarter. It’s hard for me to imagine a team winning a game in which all their field goals (twenty), but one (Kieran Beck three), are scored in the paint. Belmont connected seven times from long range. 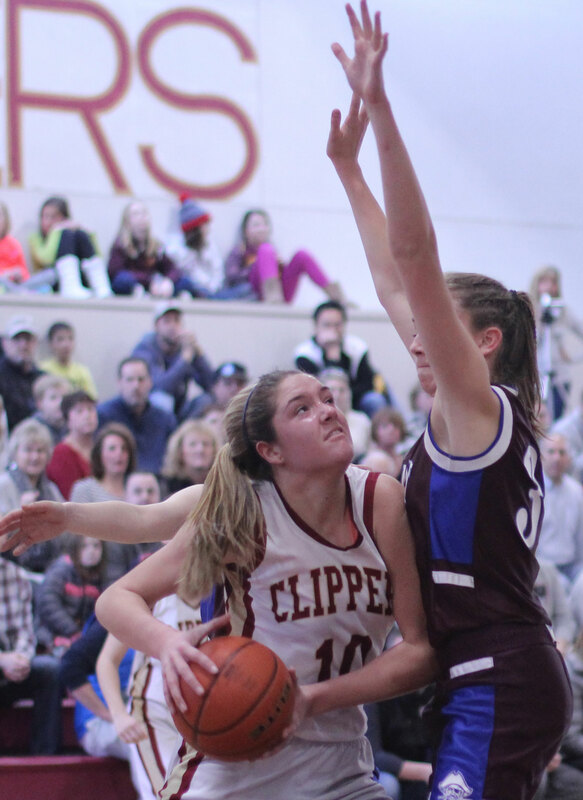 They came very close twice to an eighth 3-pointer in final twenty seconds that could have given them the victory. 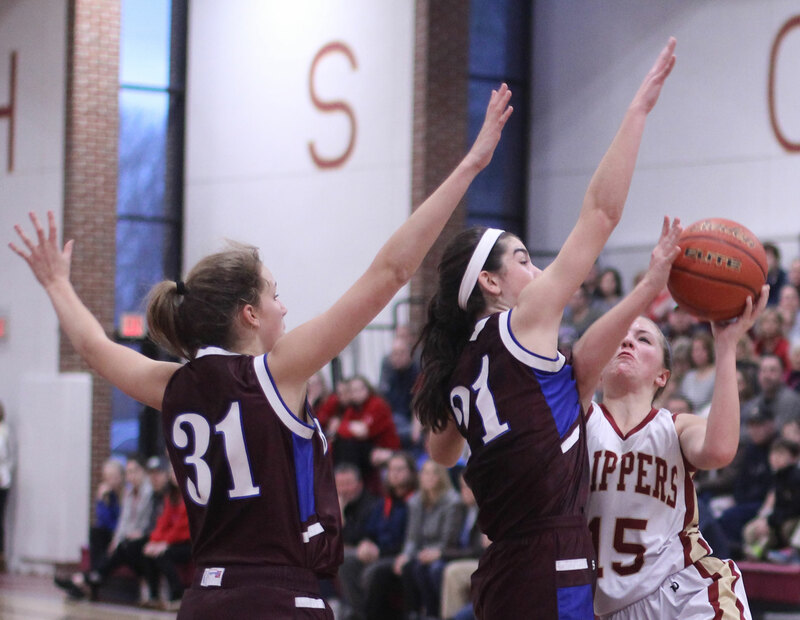 The Marauders trailed 12-10 in the first quarter before running off eight straight points. 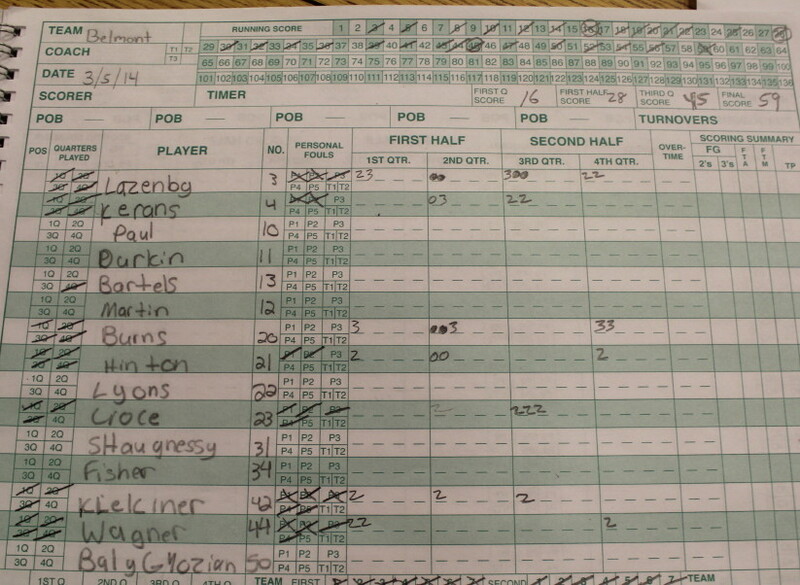 The points came from Adam Kleckner with four and Justin Wagner and Jalyn Hinton two each. 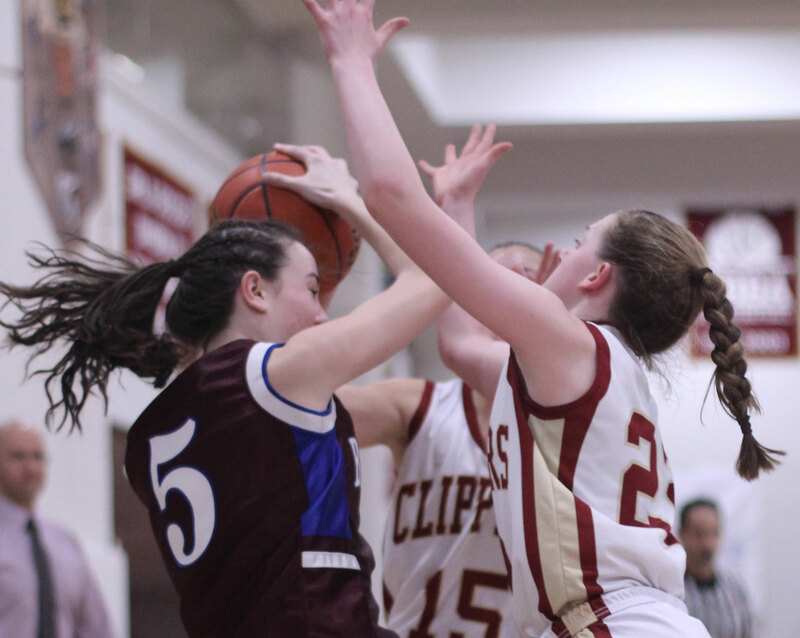 Trailing, 18-12, it was #2 Danvers’ turn to run consecutive points. The Falcons put together a steak of nine unanswered. 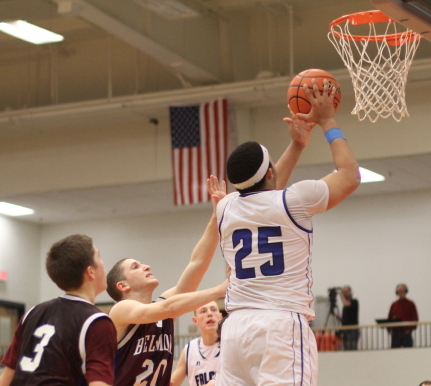 It was Devan Harris scoring on his own miss and following that up with a layup on a nice pass from Mark McCarthy. 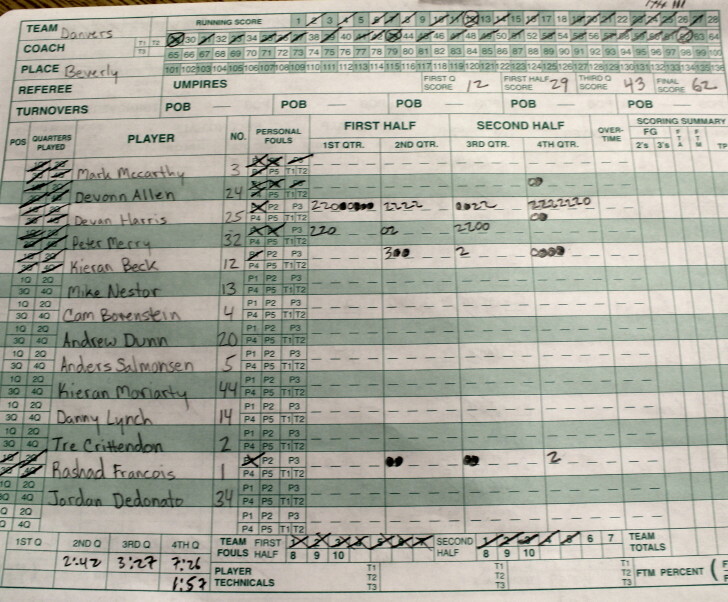 Kieran Beck did the rest with the lone Danvers outside score and two free throws. 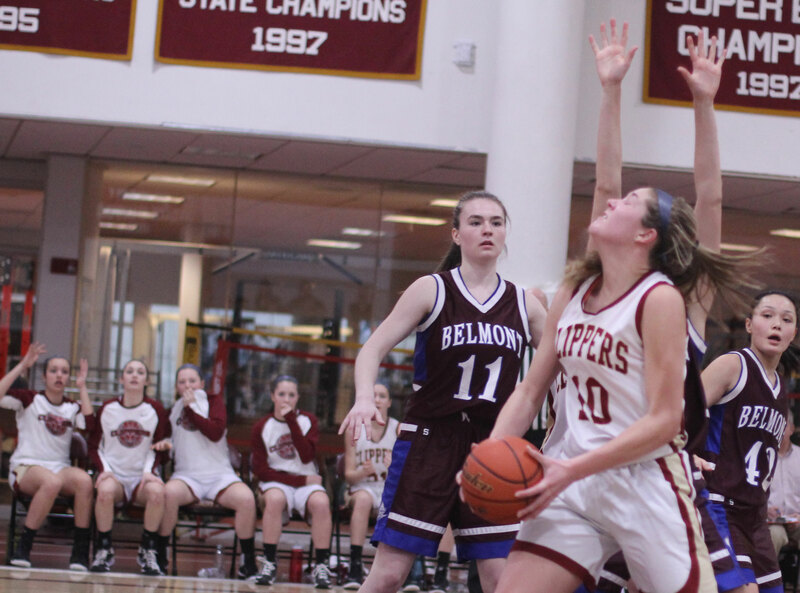 Belmont hit two 3’s late in the second quarter (Keith Burns and Matt Kerans) to erase a Danvers five-point lead. 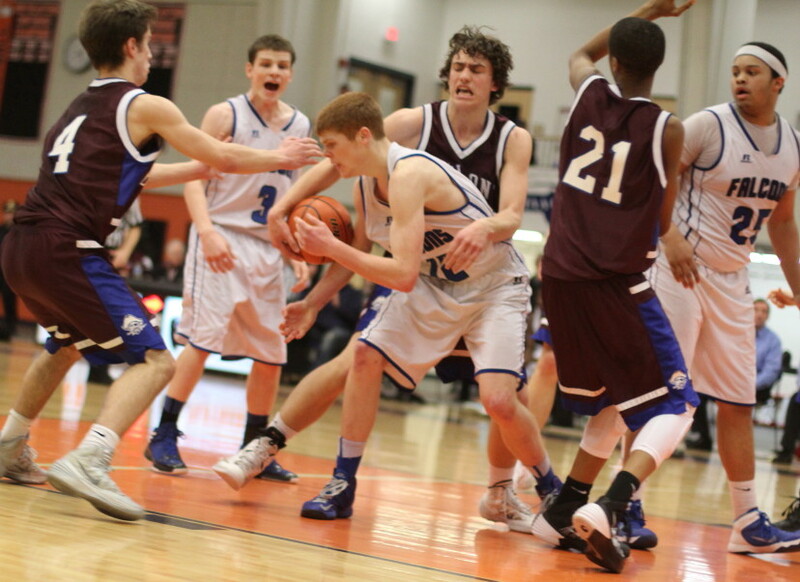 Danvers led, 29-28, at halftime. 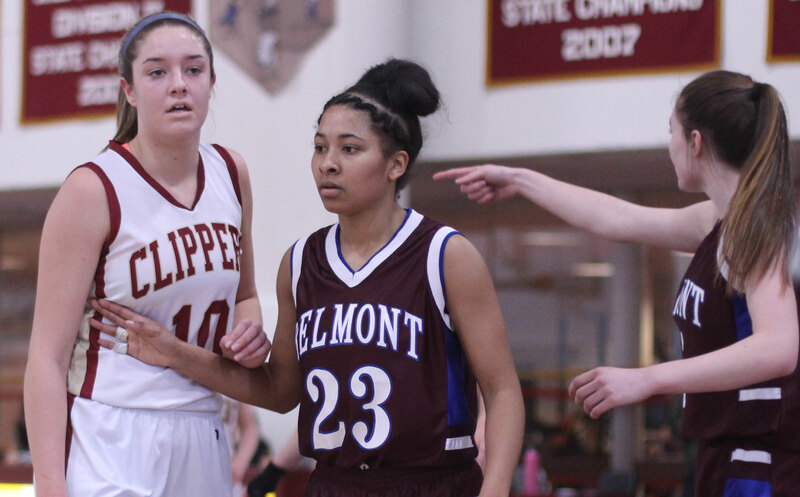 Devan Harris erased a four-point Belmont lead (39-35) in the third quarter with two layups and two free throws. 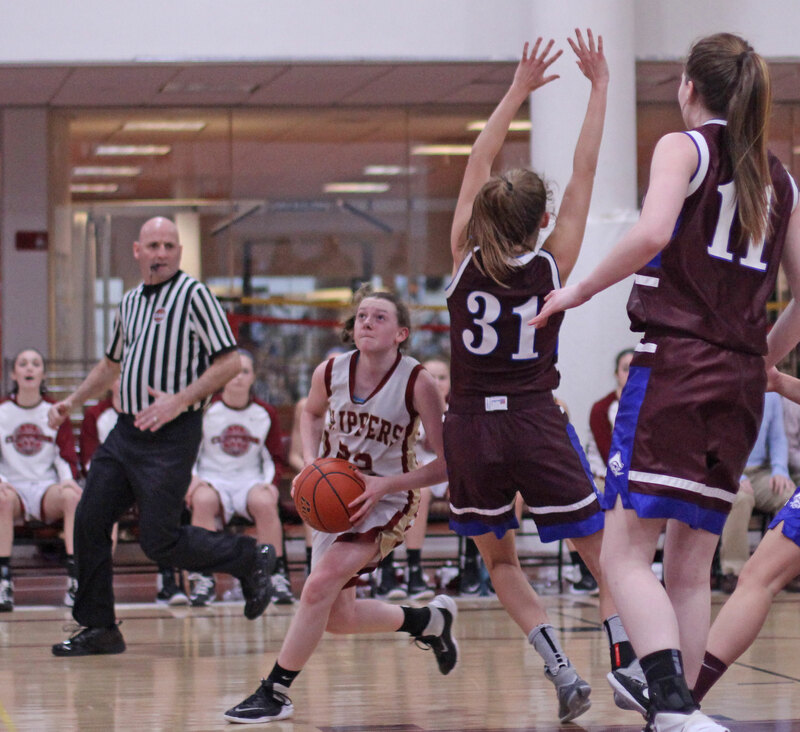 The Marauders broke a 43-43 tie with a seven-point run stretching into the final quarter. 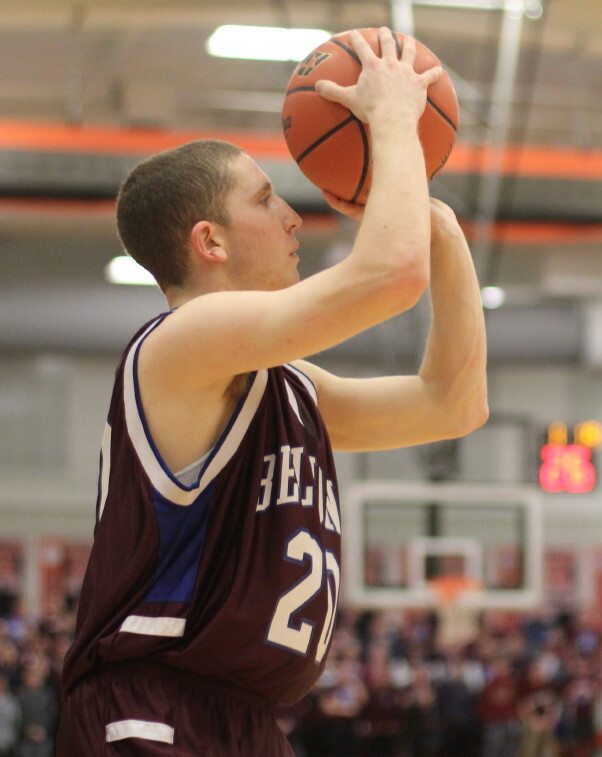 A layup and two free throws by Matt Kerans were followed by a long one from Keith Burns. The resulting 50-43 spread with 7 1/2 minutes left looked like the beginning of the end for the Falcons but they came back with three inside scores (layups Devan Harris and Rashad Francois plus a converted rebound by Devan) and cut the Belmont lead to one (50-49) six minutes left. There were five lead changes the rest of the way and plenty to cheer about for both fan bases. Former Falcon point guard Eric Martin was in the house. No question Coach John Walsh would have found a spot for him on the floor especially in the second half when Danvers had thirteen turnovers. But despite the deficiencies the Falcons found a way to win and extend their improbably season. No one imagined such a successful season for a team losing four starters and Vinny Clifford. Kieran Beck and Peter Merry each had ten points for Danvers. 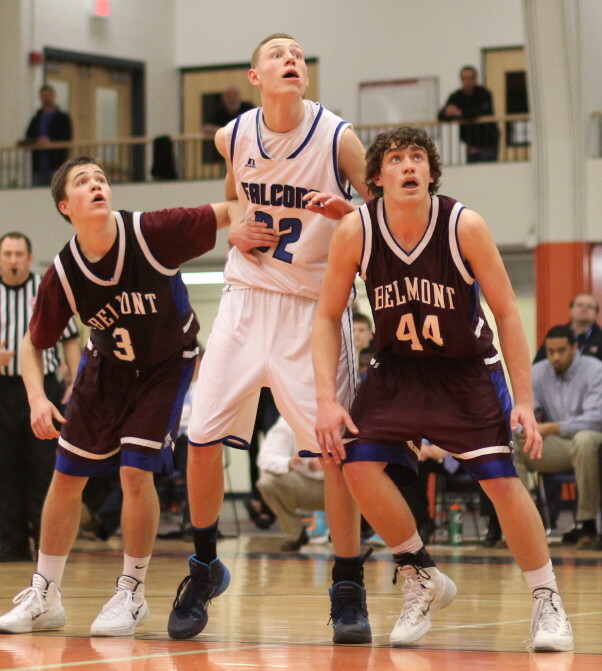 Ben Lazenby (16) and Keith Burns (14) had double figures for Belmont. 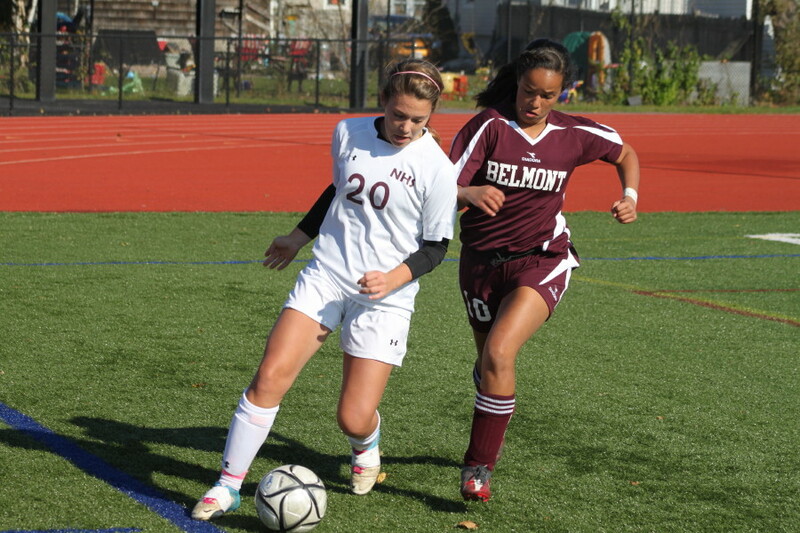 Belmont is out of the Middlesex League while Danvers plays in the Northeast Conference. 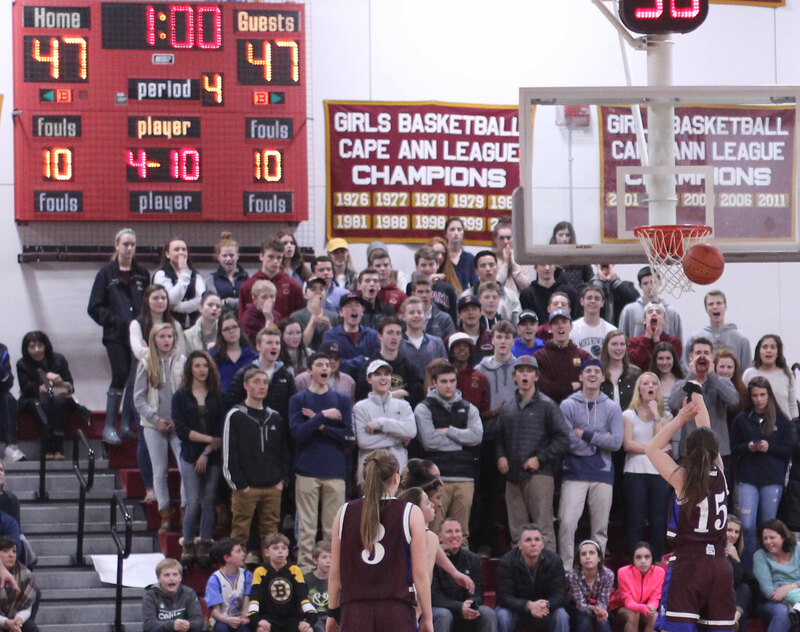 There was certainly a good crowd on hand but the noise and numbers hardly compared to the reported 3,500 in attendance for the St. John’s/Central Catholic game the night before. 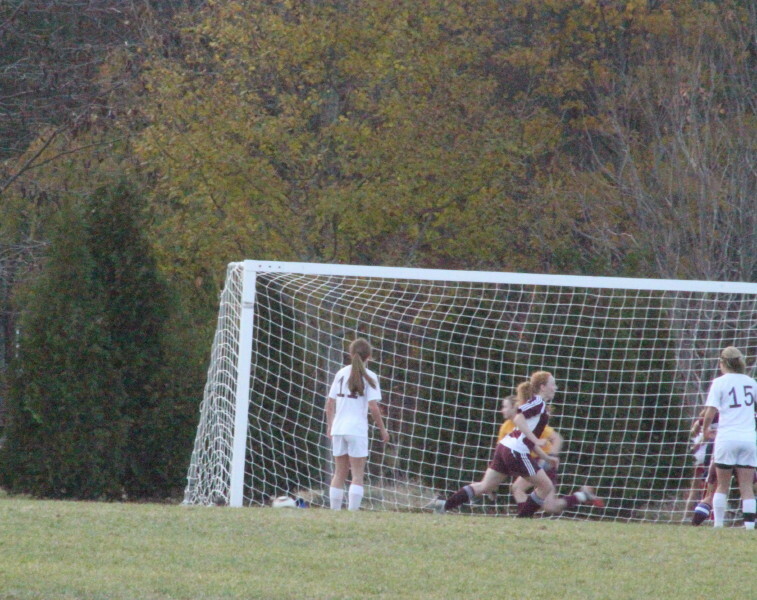 NHS goalie Lilly Donovan chases ball to her right that would go off the goal post in the last minute of regulation. 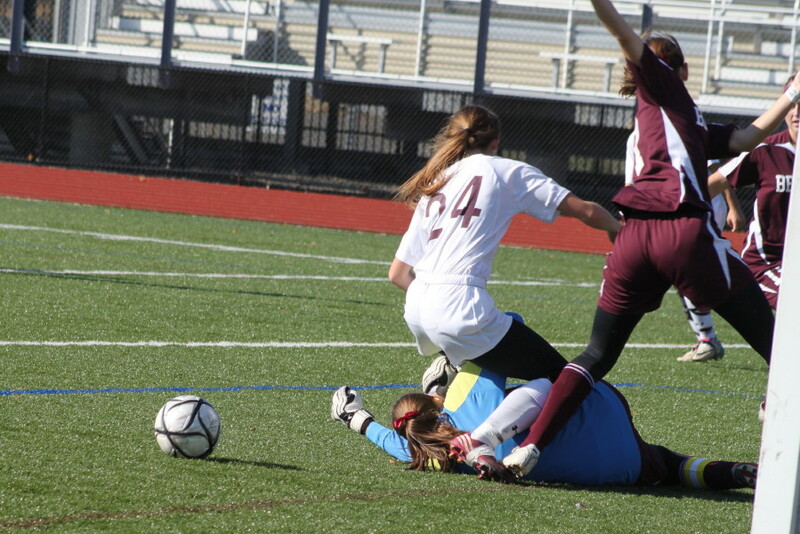 Kerry Johnson (4) heads in the game winner as Liza Twomey gets tangled up with BHS goalie Nina Perrotta. 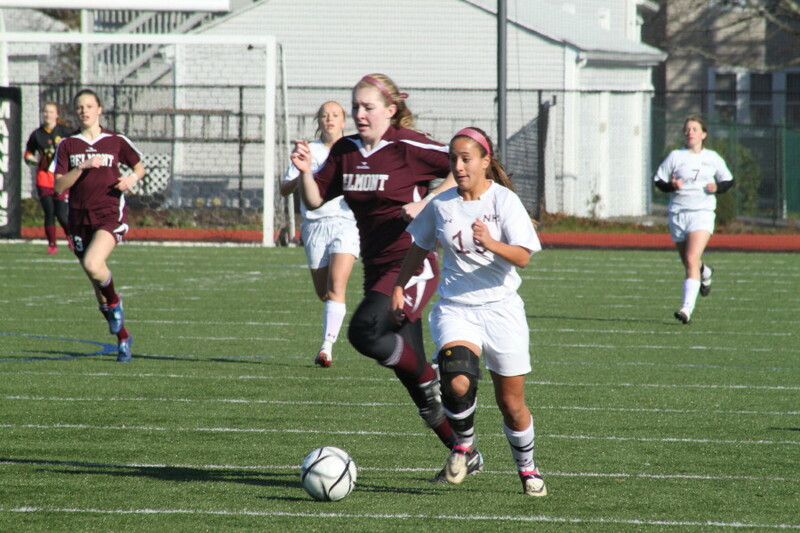 (Newburyport) A year ago the Belmont Marauders girls soccer team defeated the Newburyport Clippers, 1-0, in the Division 2 North quarter finals at Belmont. 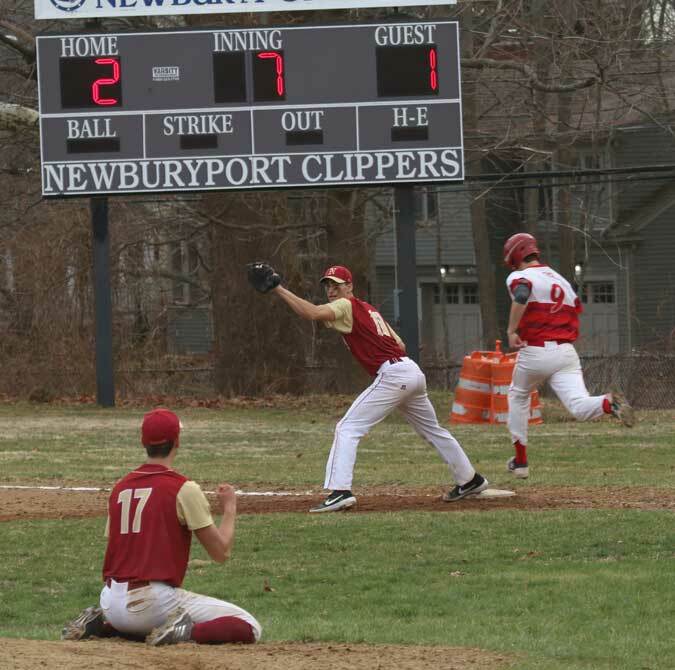 This time around, with a change of locations, it was the Clippers besting the Marauders, 2-1, at Cherry Hill Field in Newburyport on sunny Tuesday afternoon. 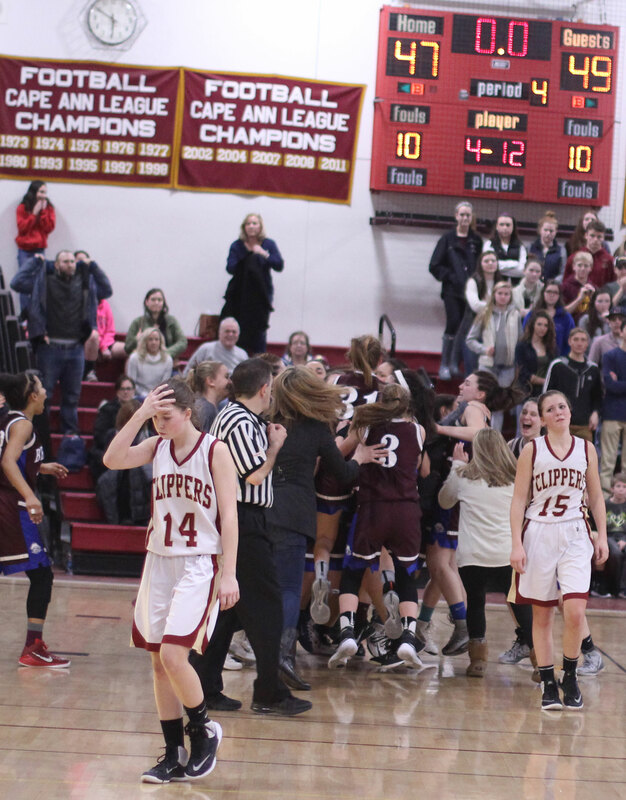 The victory gets Newburyport to the D2 North semifinals with Gloucester on Thursday (7:30PM) at Woburn High School. 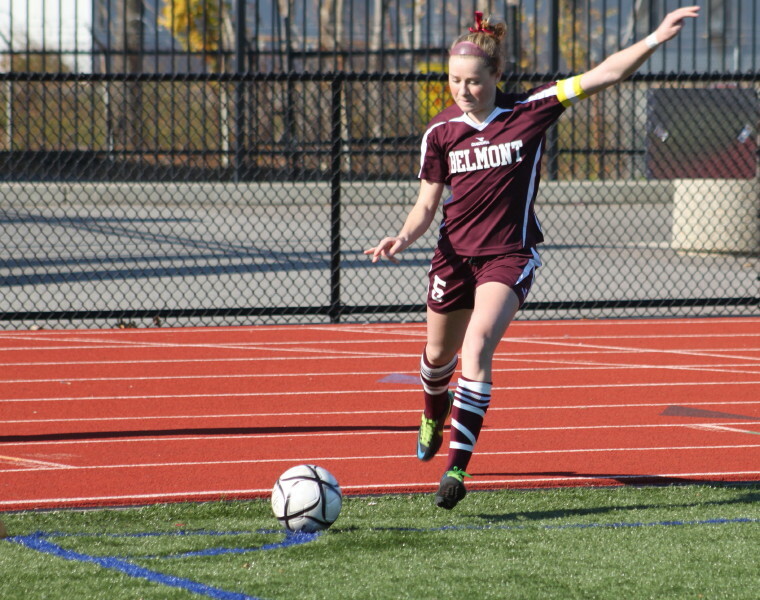 The Clippers (15-2-3) picked up their two goals in the first half and had to hold on for dear life in the second half as Belmont (10-7-2) came incredibly close to getting all the way back. 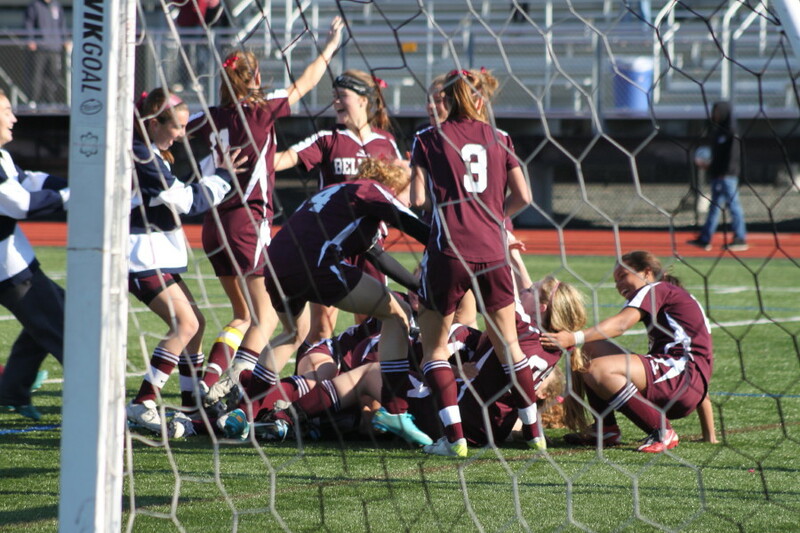 The constant pressure Newburyport attackers put on defenders paid off big-time in the last ten minutes of the first half as two direct kicks (by Hannah Martin) turned into goals. 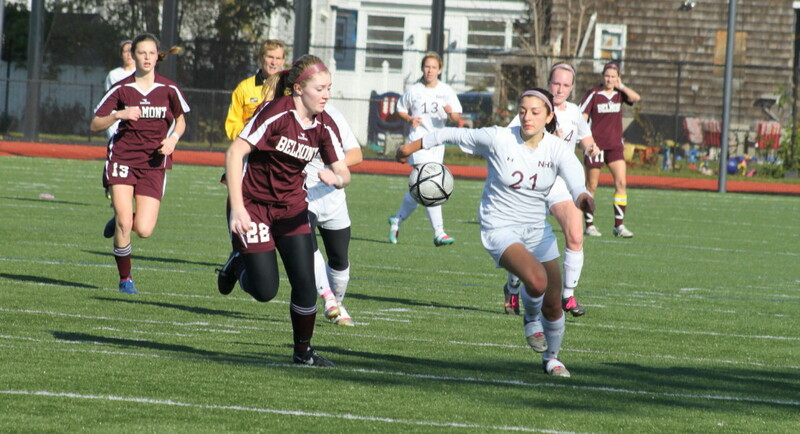 Hannah Martin direct kick bounces over goalie for first Clipper goal. 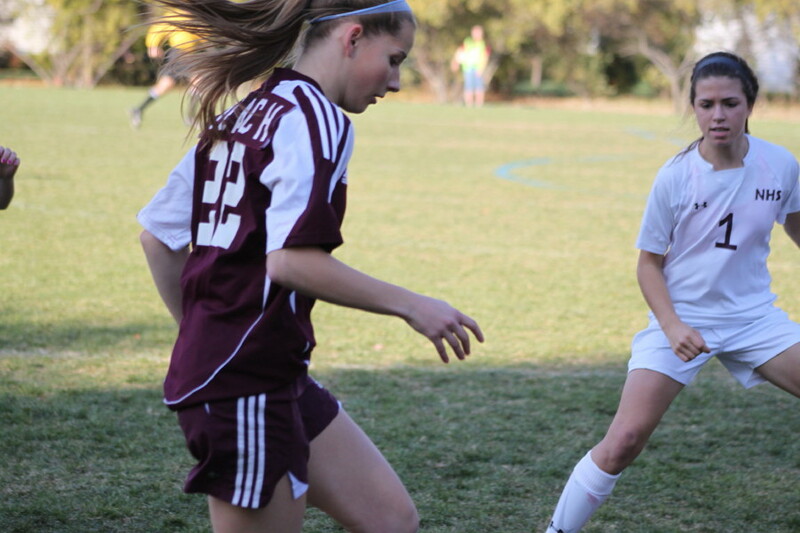 Maryam Moshrefi drew the penalty that led to Hannah Martin’s direct-kick goal at 30:43. 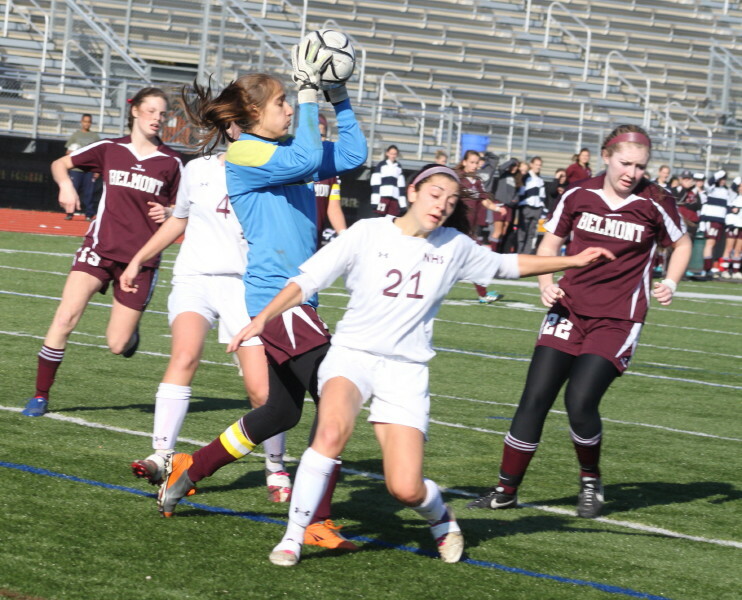 BHS goalie Nina Perrotta had Clippers coming at her as Hannah’s kick took an astro-turf bounce into the net. 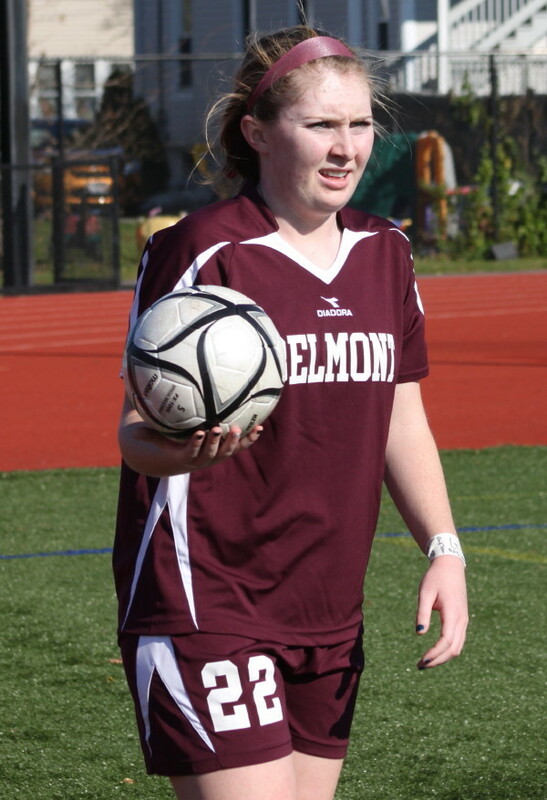 Later, Liza Twomey was taken down by Belmont’s Izzy Goldstein for another goal-resulting direct kick by Hannah Martin. 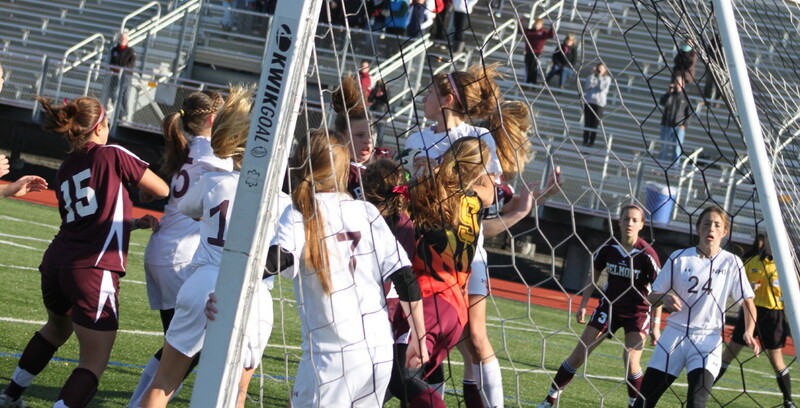 This time the BHS goalie got tangled up (What is goalie interference?) 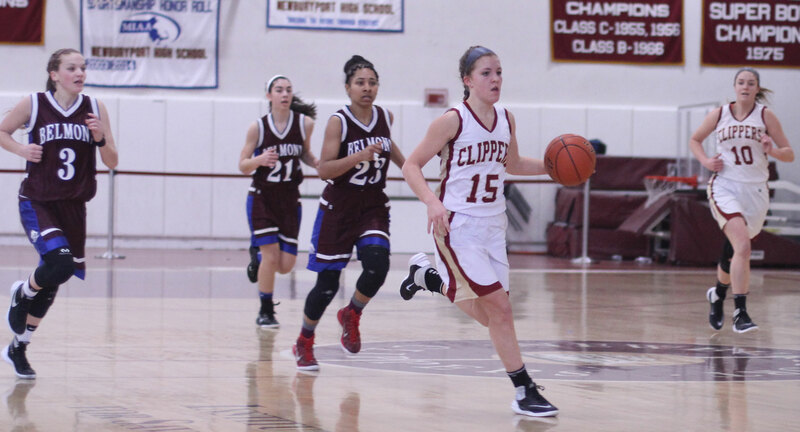 with Clipper Liza Twomey and a rebound was left that Kerry Johnson put home at 38:00. That lead looked safe for the longest time in the second half. 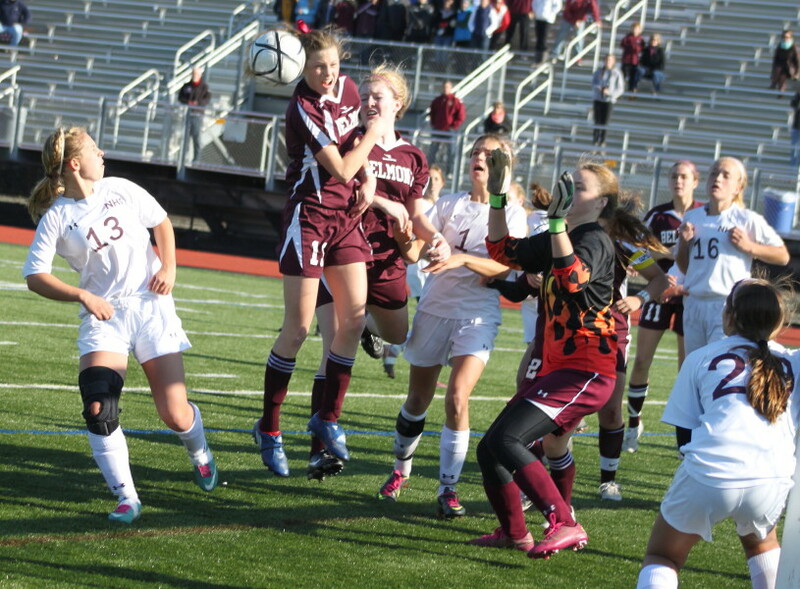 Things seemed to change, however, when Maryam Moshrefi inadvertently kicked the BHS goalie in the head. Belmont coach Paul Graham, who had been riding the far side official a good part of the game, was infuriated by the lack of a call. His persistence earned him a yellow card at 25:51 of the forty minute second half. 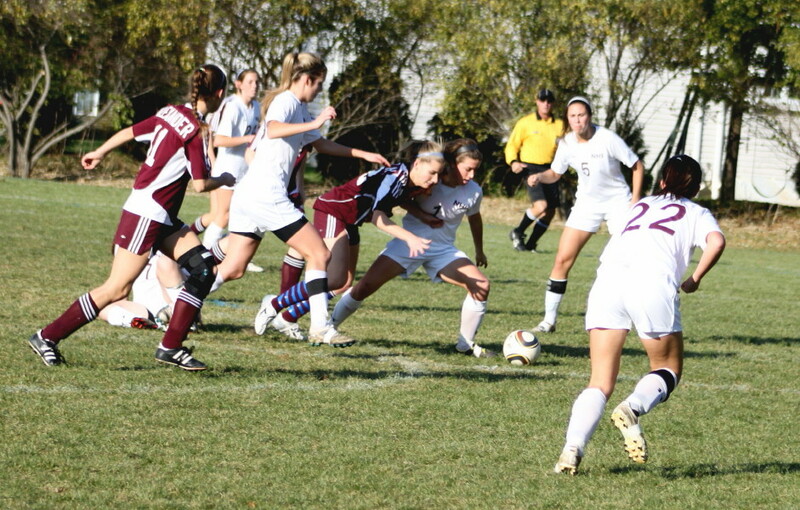 Three minutes later it was the Marauders’ persistence in the offensive end that turned up something good for them – Aly Leahy got called for a hand ball in the box. 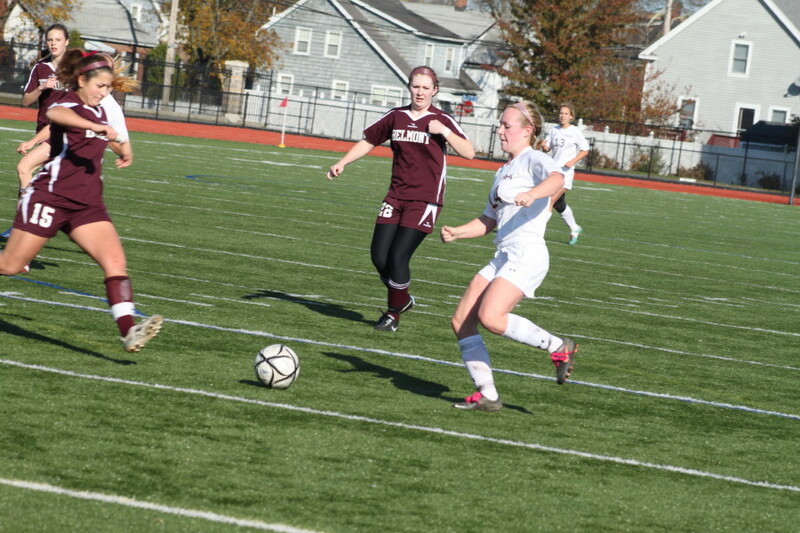 Izzy Goldstein (6) finds the right corner with her second half penalty kick. 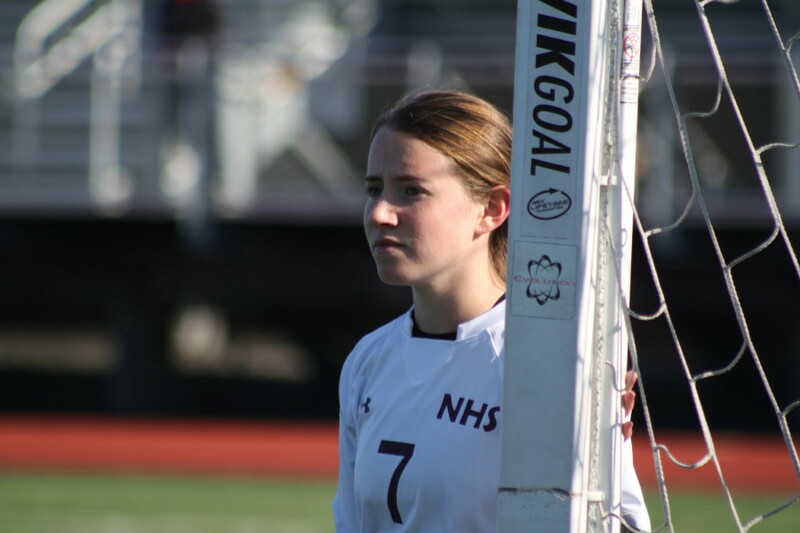 Izzy Goldstein took the resulting penalty kick and beat NHS goalie Lilly Donovan with a shot just inside the right goalpost. 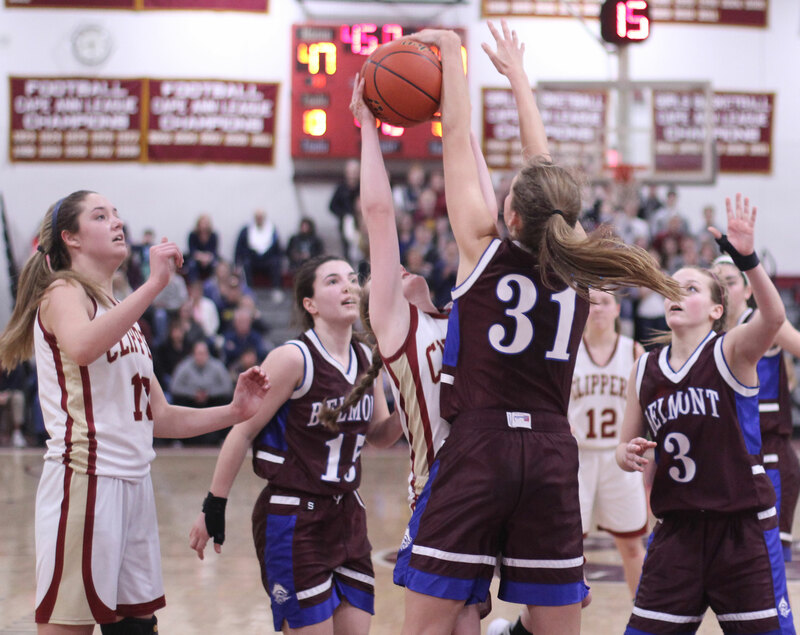 So with 11 ½ minutes left, Belmont only trailed, 2-1, and they pressed in with numbers every time they had the ball in the Newburyport end. The, “Remember when,” sequence from this game was in the last minute of regulation as Belmont attacked from the right side. 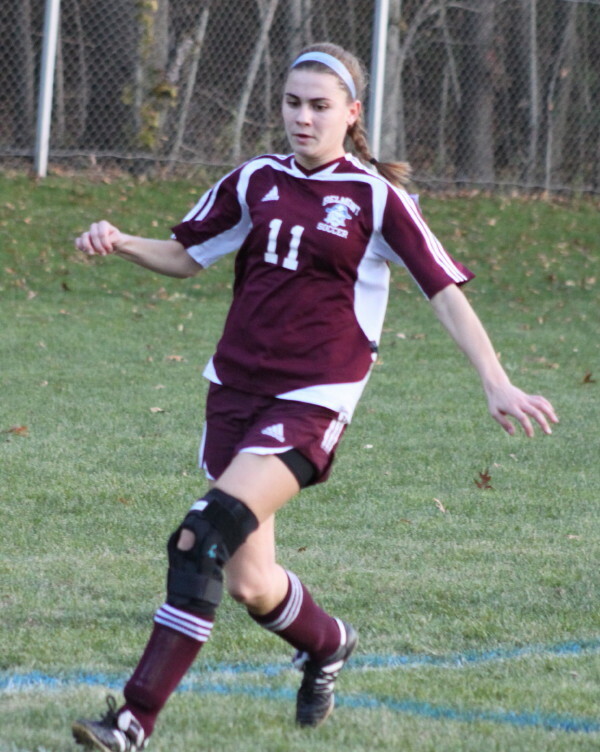 I was too far away to name one of the Marauder players involved but I did see Emma Teach rip a direct kick toward the Newburyport goal. A rebound resulted close to the goal, and a second shot from in close went past Lilly Donovan off the far goal post and off to the left with twenty-four seconds left. I saw the final BHS shooter afterwards with her hands on her head in amazement/disappointment that the shot hadn’t gone in. But it hadn’t and time ran out for Belmont. 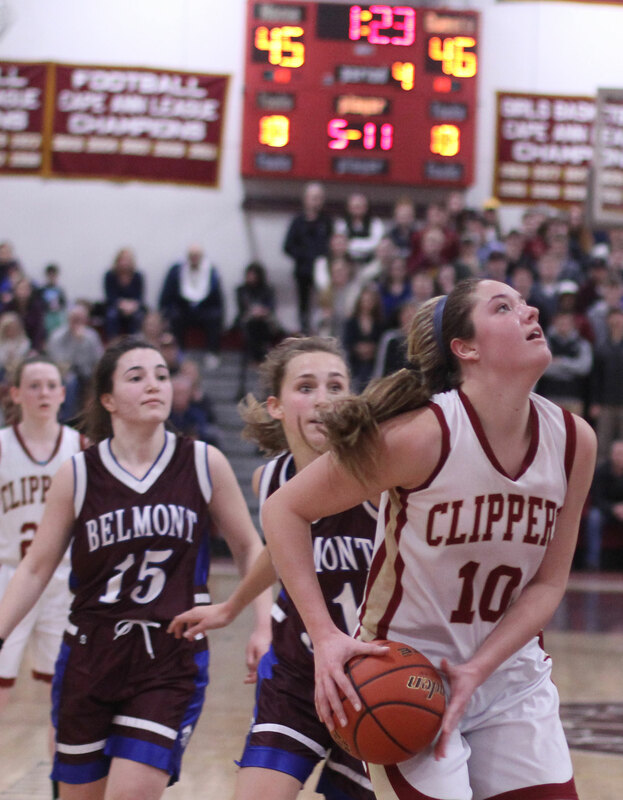 Carly Brand heads out a Marauder shot in the first half. 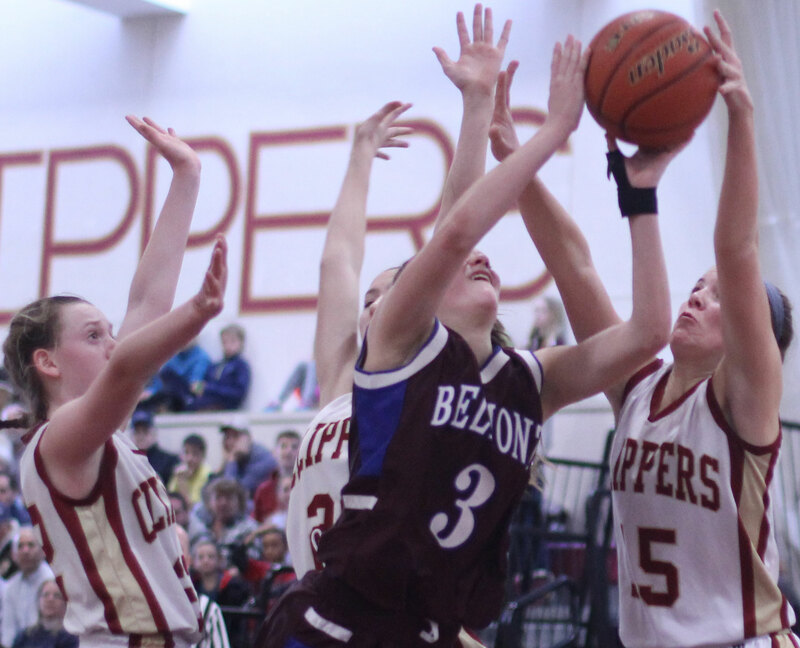 Carly Brand headed out a near-goal in the first half. 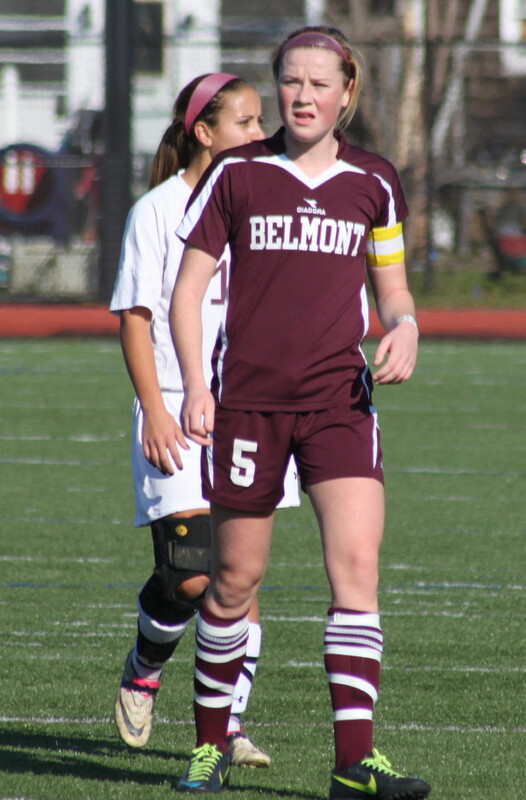 Belmont wore shirts with numbers on both sides and their names on the back of the shirt…..a photographer’s delight. Then there was Pentucket, two days ago, with numbers only on the back. Ideal weather conditions for November 8th……..temps in the 60’s with hardly a breeze. (I take my own pictures and write my own commentary. I own any mistake.) All the pictures will enlarge if you click on them. 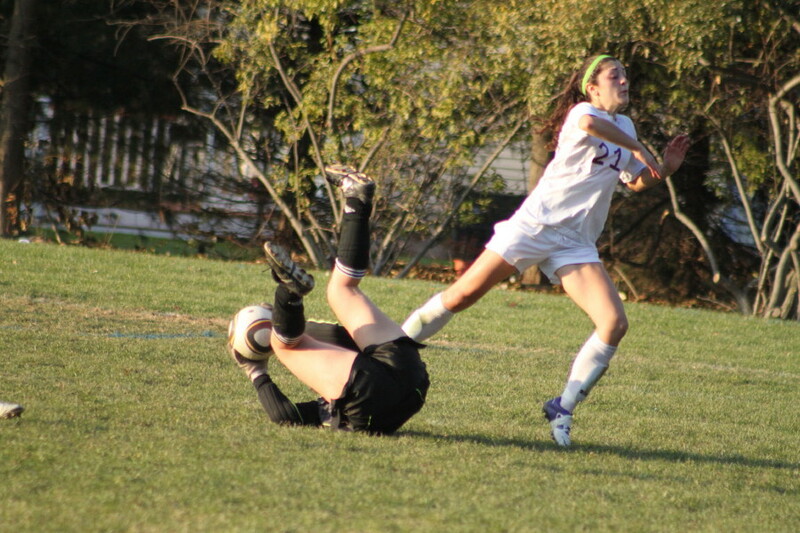 Maryam Moshrefi inadvertantly kicks the Belmont goalie. 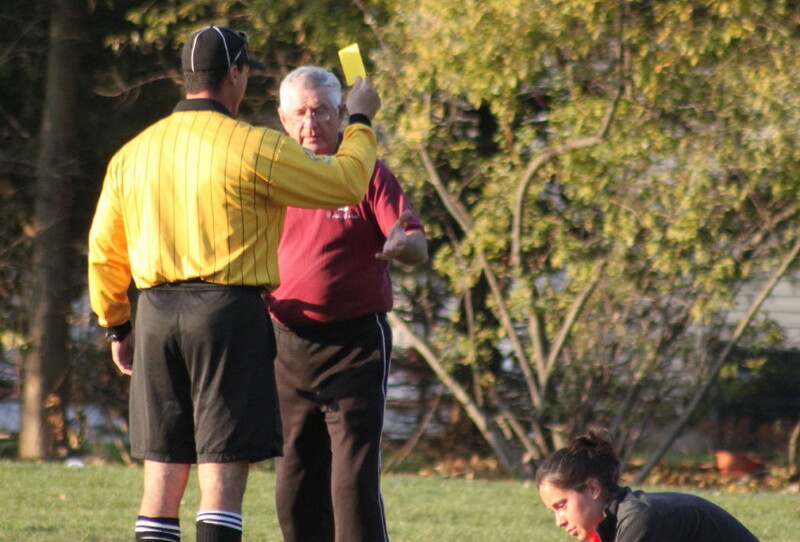 BHS coach Paul Graham gets yellow card.